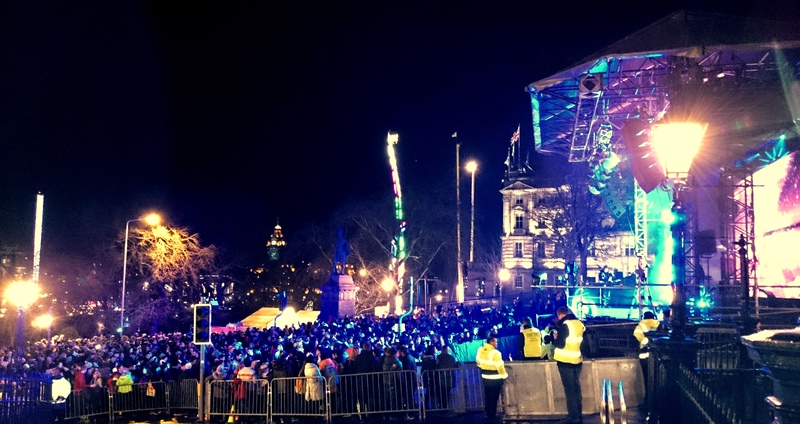 This post documents my experience as an official local blogger for Edinburgh’s Hogmanay 2014/15. Most people associate Edinburgh’s Hogmanay with the party on New Year’s Eve, but the #blogmanay programme spanned a week, with many local businesses extending a Scottish welcome to bloggers from across the globe. What more iconic way to kick things off than a tour at The Scotch Whisky Experience on Castlehill? Here we were taken into a purpose-built vault to see the world’s largest collection of whiskies, numbering 3384 bottles amassed by Brazilian aficionado, Claive Vidiz, over 35 years. Two vintages singled out during our tour were The Taghta and Black Bowmore. The former is Scottish Gaelic for ‘The Chosen’, as befits a completely crowdsourced whisky, from the cask in which it was matured to its name, bottle and packaging design, promotional photography, and launch event. We were even treated to a dram; I’m no whisky connoisseur, but it certainly tasted different (better) than any I’d had before! Black Bowmore, its name referencing its ebony colour and the first recorded distillery on Islay, was deemed the most valuable bottle in the collection, estimated at around £35,000 (asking for a taste might have been pushing it). 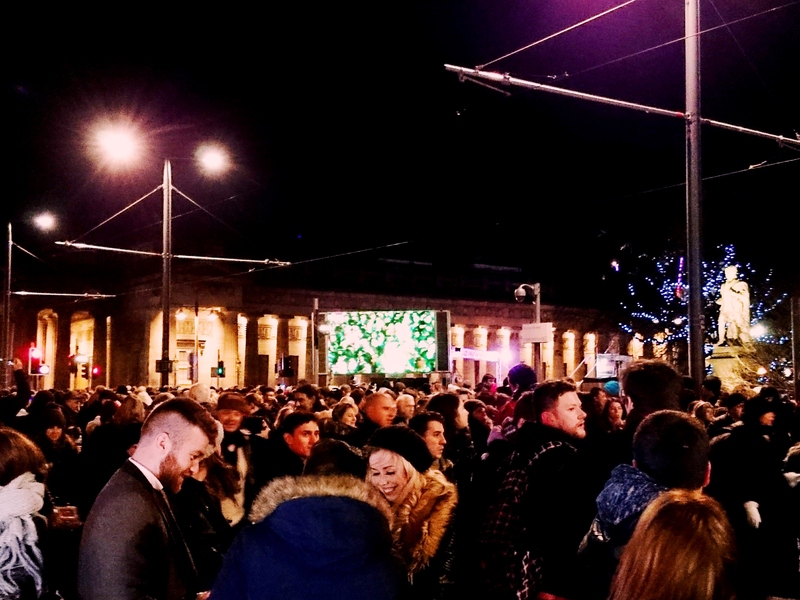 On New Year’s Eve, we bloggers joined the rest of the city to partake in the Torchlight Procession, an annual tradition whereby pipers and drummers, tailed by Up Helly Aa Vikings, lead a torchbearing parade down The Mound, across Princes Street, and up Calton Hill. The turnout for the event was a spectacle in itself, the route lined with spectators, some of whom joined the glowing throng as it passed. Amidst the torchbearers myself, I found it most striking when rounding the bends, especially from The Mound toward Princes Street, where a ‘sea of fire’ snaked ahead as far as the eye could see. At the top of Calton Hill, I was treated to a bonfire, followed by a ravishing fireworks display set to music and cleverly commencing within the majestic National Monument. Met with universal applause from the crowd, the show set a high precedent for the eagerly anticipated display billed for the big night. And what a night it was. To begin my circuit of the festivities, I returned to the top of The Mound, where a Hot Dub Time Machine DJ set took revellers through the decades to the variegated sounds of each year’s biggest hits. At 9pm, ABBA parody band Bjorn Again kicked off the celebrations in the party’s centrepiece, The Concert in the Gardens, while its localized counterpart, The Scottish Stage on Frederick Street, was graced by Eddie Reader following a brief fireworks display signalling the end of the hour. Reader’s proficiency with the local dialect reminded me that I was home after all. I then negotiated my way along Princes Street, innumerable partygoers captivated by a line of screens synced to the Hot Dub DJ set. On The Mound Precinct, Hugh MacDiarmid’s Haircut played for the keilidh, jovial dancers forming a sprawling mass underneath the multicoloured spotlights and against the august backdrop of The Royal Scottish Academy. Our national presence extended to The Waverley Stage, with Scottish punk rock band The Twilight Sad prevailing over the leftmost strand of the fête. After more tantalizing fireworks, I completed my circuit in rejoining The Concert for 11.30pm, where zesty headline act Lily Allen was received with aplomb, her psychedelic set of LED pacifiers – and the world’s swaggiest drum kit – complemented by her assured, soothing vocals and glitzy getup (provocatively pared down, and then up again because of the cold). Allen took a brief hiatus for the world-renowned midnight fireworks, another sensory delight set to pop music, the night sky incandescent with its closing barrage. The camaraderie pervading the enclosure manifested in friends and strangers joining hands for Auld Lang Syne, a special moment that personalized the afore-intimidating crowd, which in all numbered around 75,000. Allen returned to begin 2015 in style, and beckoned a spirited fan on stage to duet for her closing number. Having grown up in the secluded Scottish highlands, this was my first concert, and although she was the only act I saw in entirety, I left satisfied – even as others in the enclosure were calling for one more song! New Year’s Day saw Scot:Lands, a series of Scottish showcases held in enviable venues throughout Edinburgh’s Old Town. Neu:Land was hosted in The Hub (aka Edinburgh Festival Centre), and presented by Neu:Reekie, a local arts collective. Edinburgh- and Glasgow-based 4-piece Teen Canteen performed before a showing of Kenny McAskill’s riveting daredevil short “The Ridge” (if you’re sorry for having missed out on the public screening, don’t forget the upcoming mountain film festivals!). Next, it was across to the splendid St Giles’ Cathedral for an interpretation of Hugh MacDiarmid’s poem ‘Scotland’, courtesy of Dance Base. Finally, Hebcelt Festival created Hebcelt:Land in Edinburgh University’s McEwan Hall, where Rura regaled us and Malin played for the climactic ceilidh, the audience eventually (!) getting to their feet to fill the grand central hall. Our send-off show on the 4th of January was performed in the St Andrew Square spiegeltent, erected for Edinburgh’s Christmas. Billed as a raucous burlesque, this was another first for me, so I wasn’t sure what to expect of ‘Briefs: The Second Coming’. Given it was staged at a late hour I only anticipated that it would be risqué; and that it was, moreover in the way that delights, which is to say, self-consciously, brazenly, and therefore hilariously. Ample light relief came in the banter of our witty and warming transvestite host, Shivannah, as well as in the prevalence of bananas, with which several audience members were victimized (fortunately I wasn’t among them!). Most memorable for me, however, was the skilfulness undergirding the show: the acrobatics were awesome, Shivannah’s magic breathtaking, and the ensemble elements captivating. Sadly, for prudent health and safety reasons photos are prohibited, which does them a disservice with all the spectacle involved. Briefs was a revelation and I’ll be catching them again if they’re back for the Fringe this year. 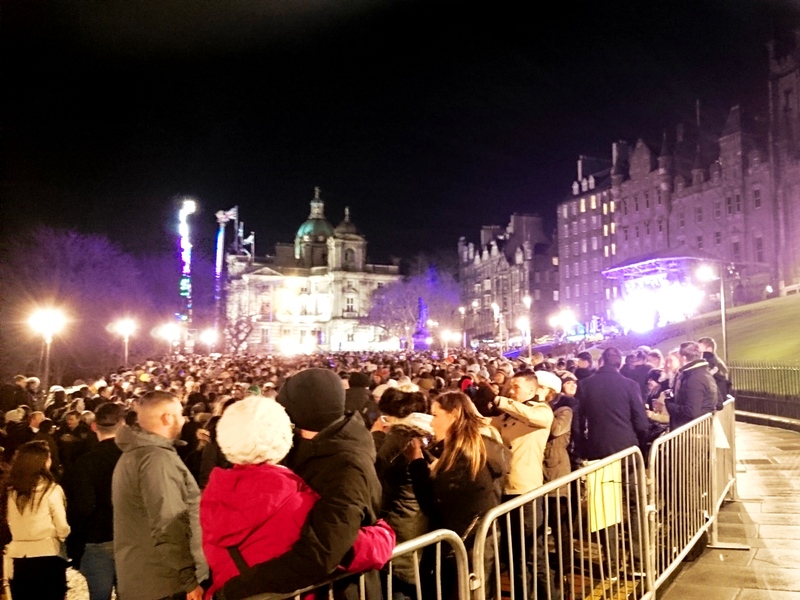 I thoroughly enjoyed my experience blogging for Edinburgh’s Hogmanay. It had a high novelty factor with my first concert, my first burlesque, and my first venture as an official blogger. The atmosphere throughout was upbeat, the shows were exciting and often surprising, and overall it left me with many memorable experiences to close one year and begin another on a high. A big thank you is due to the parties mentioned in the disclaimer below, and to Charlotte Gosling, our handler from organizers Unique Events, in particular. #blogmanay is brought to you by Edinburgh’s Hogmanay and is supported by ETAG, EventScotland, VisitScotland, Homecoming Scotland and co-creators Haggis Adventures. Created and produced by Unique Events. As always, all opinions expressed here are entirely our own.